KIEV, Ukraine -- President Viktor Yanukovych is close to claiming another conquest: marginalizing political opposition to him. After taking control of the government, parliament and courts, President Viktor Yanukovych is close to claiming another conquest: marginalizing political opposition to him. Ex-Premier Yulia Tymoshenko is loosing her clout. That opposition, for now under the leadership of defeated rival ex-Prime Minister Yulia Tymoshenko, continues to shrink less than two months after the president’s Feb. 25 inauguration. The demise picked up speed after a controversial April 8 decision by the nation’s Constitutional Court that allows individual lawmakers – despite being elected on party tickets -- to change their political allegiances as they please. This could lead the way to the splintering of Tymoshenko’s once-solid bloc of 150-plus parliamentarians, more than a third of the 450-member Verkhovna Rada. Soon, Tymoshenko’s status as opposition leader could be challenged by up-and-coming politicians, despite the fact that she came within 3.5 percentage points of being elected president on Feb. 7. Yanukovych, once shamed for his bid to win the presidency through a fraud-marred vote in 2004, is now approaching a level of omnipotence comparable to that of authoritarian ex-President Leonid Kuchma, who ruled for a decade before Viktor Yushchenko took power in 2005. “They have complete power, more than Kuchma. For business people in parliament, they don’t have to show cash to get them to switch sides,” Yevhen Korniychuk, deputy justice minister under Tymoshenko and the leader of the Social Democratic Party, a party in Tymoshenko’s former coalition, said. Korniychuk ruled out his party’s joining of the new Yanukovych-led coalition, but he suggested they would challenge the hitherto iron-clad leadership of Tymoshenko’s Fatherland Party. “Lots of people believe in her, but they want to be heard,” he said. “I want to be a Social Democrat, which is what I am, after all,” he added. However, neither Korniychuk nor Tymoshenko may be able to control all their parties’ lawmakers, some of whom continue to be lured into Yanukovych’s fold by the promise of greater influence or the threat of being left on the sidelines. Korniychuk said his Social Democratic Party, which boasts only eight parliamentary lawmakers in the 155-member Tymoshenko-led faction, has only had one defection to date. Despite its slim national representation, the Social Democrats have 700 local council members scattered throughout the nation. As long as Tymoshenko was winning, her BYuT faction’s ranks swelled. But now, with the next elections far away, her prospects look dim. “She will be able to stay on top for some time, then start petering out,” said Vadym Karasiov, a political analyst who advised Yushchenko. Among possible replacements for Tymoshenko as the country’s top opposition leader is Vyacheslav Kyrylenko, head of the political council of the Our Ukraine-People’s Self-Defense bloc, the second largest faction in Tymoshenko’s former coalition. That is former speaker, foreign minister and ex-central bank chief Arseniy Yatseniuk. He ran for president earlier this year as a fresh face – much like U.S. President Barack Obama did in 2008. But, in contrast to Obama, Yatseniuk finished a distant fourth in the Jan. 17 first round of voting. Now he is eager to claim the mantle of opposition leader. 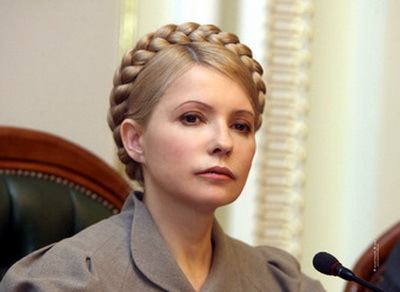 “Yatseniuk is in the opposition - but his opposition is to Tymoshenko,” Karasiov said. Yatseniuk receives strong coverage on a television channel co-owned by Ukrainian businessman Dmytro Firtash, a fierce Tymoshenko opponent whose associates are well-placed in the Yanukovych administration. Yatseniuk, however, denied being backed by Firtash or in taking sides with Yanukovych against Tymoshenko. But political analysts and Tymoshenko’s allies see Yatseniuk’s role differently. “He [Yatseniuk] represents the official opposition, for the benefit of the official coalition,” Social Democrat leader Korniychuk said. The Yanukovych bandwagon continues to pick up members. According to Karasiov, it’s currently at 240 lawmakers - 14 above the 226-member majority needed. The goal of having 260 loyalists is needed “to decrease the influence of their coalition partners, the Communists, who have been blackmailing them with a leftist agenda,” Karasiov said. Tymoshenko’s BYuT bloc has already lost seven or eight deputies and will likely lose another 10, he added. Formerly BYuT lawmaker Volodymyr Ivanenko recently was reported to have become the latest defector – joining the Yanukovych camp and bringing the current number to 241 this week. Meanwhile, one of the more damaging defections to Tymoshenko came from Andriy Portnov, a lawyer who represented Tymoshenko in her unsuccessful appeal against Yanukovych’s electoral victory. Portnov is now deputy head of Yanukovych’s administration, in charge of reforming the country’s corrupt courts. Other top members of the Tymoshenko camp who are being watched for a change in loyalty include businessman Andriy Verevsky, owner of Warsaw-traded agro firm Kernel, who was among those who voted for Mykola Azarov as premier. Tymoshenko’s loyalists are still putting on a brave face. “We are very calm that we will be able to maintain the integrity of our faction,” said Taras Postushenko, head of the press service for Tymoshenko’s BYuT faction in parliament. BYuT leader Mykola Tomenko, speaking after a session of the council of opposition forces on April 12, acknowledged the opposition no longer has much voice or much power. It was as the voice of the opposition that Tymoshenko rose to influence politically, fighting against corruption of the Kuchma era and as the iron-willed leader of the Orange Revolution in 2004. But politically, the end may be near. “Everyone [in the media] is talking about how the new president and government are getting on – as if the opposition isn’t doing anything,” Tomenko noted. According to Karasiov, Tymoshenko – who became wealthy in the 1990s under the sleazy patronage of convicted money launderer ex-Prime Minister Pavlo Lazarenko – is “out of sync” with the political mood. “She is tired and doesn’t know which way to turn,” Karasiov said.